Makes about 12-14 corn dogs. Heat frying oil to 365°. Prepare a “flax egg” by mixing together the flaxseed meal and water in a tiny bowl and allowing it to sit for a few minutes until gooey. In medium/large mixing bowl, stir together dry ingredients. Add milk and flax egg, and mix until combined. To prepare for dipping frankfurters into the batter, fill a tall drinking glass 2/3 full with batter. If the frankfurters are slick/wet, pat dry or roll in a bit of flour to encourage batter adhesion. 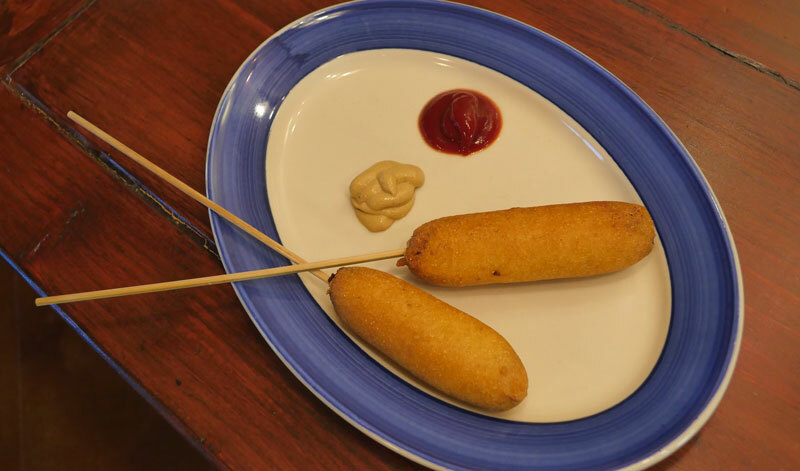 Stick a skewer part way into each frankfurter, then dip each in to the cup of batter to coat (refill cup as needed). Slide corn dog off of skewer and into the oil. Fry for approximately 5 minutes until all sides are golden brown. Remove from oil and allow to cool for about a minute. Stick a skewer into the dog for a fun eating experience. One Response to "Vegan Corn Dogs"